If you are about to start looking for a calendar for 2009 then look no further! 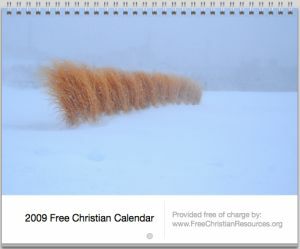 I’ve created a 2009 Christian calendar that you can download for free. Each month has a high quality picture and a bible verse. There is also space for you to write your diary entries. 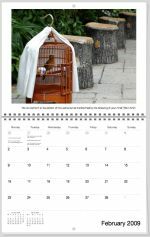 You are free to distribute and print the calendar as many times as you like. The calendar is in a PDF format and was created in iPhoto. Simply follow the steps below to print out your free Christian calendar for 2009. To save space I’ve zipped the file. If you have a PC right click here with your mouse and select “Save target as…” . If you have a Mac then right click or hold [ctrl] and click here and choose “Save link as…” from the menu. You have a couple of choices here. If you like life to be easy you could pay a printer to print it off professionally. Obviously this isn’t free but you may get a better output depending on how good your printer is. The alternative is to print it out yourself. You could just print it out on normal paper if you need to save costs. For best results though use proper photo paper and put the pictures on the glossy side (apart from the cover page). Create a hole single hole punch in the middle of all the top of each of the pictures. You’ll use this hole to hang it up. Then you just need to attach all of the pages together either by using a spindle or some other method. You should be able to get a good idea by looking at the pictures in this post. Most of the pictures for the calendar have come from Flickr. These have been provided free of charge and legally by whoever took the pictures. The links to all of the pictures are given on the calendar on the relevant page. the wind didn’t listen my voice. Pastaj pyeta: Malin, detin, erën. era zërin tim s’e qaste. Pyeta edhe yjet, diellin, hënën. Por, ata më thanë të pyesja nënën. –	Ρώτα τη μάνα σου. –	Μόνο ο Θεός ξέρει. να ζουν σε Θεία διάσταση, μ’ ευλογημένους τρόπους! νοιώθουν μια άρρητη χαρά, κι’ όλα τα διορθώνουν! Thanks a lot my Lord for all the good things and difficulties in my Life!! !